"Holy Priest Anonymous one of Sachsenhausen"
International Holocaust Remembrance Day honors the victims of the Nazi era, including the estimated 5,000 to 60,000 sent to concentration camps for homosexuality. The United Nations set the date as Jan. 27 -- the anniversary of the liberation of the Auschwitz-Birkenau camp. Established by the UN in 2005, International Holocaust Remembrance Day recalls the state-sponsored extermination of 6 million Jews and 11 million others deemed inferior by the Nazis, including 2.5 million Poles and other Slavic peoples, Soviet prisoners of war, Gypsies and others not of the "Aryan race," the mentally ill, the disabled, LGBT people, and religious dissidents such as Jehovah's Witnesses and Catholics. Holocaust Remembrance Day aims to help prevent future genocides. The date chosen is the anniversary of the liberation of Auschwitz-Birkenau, the largest Nazi death camp, by Soviet troop on Jan. 27, 1945. Approximcately 100,000 men were arrested from 1933 and 1945 under Paragraph 175, the German law against homosexuality. They were imprisoned or sent to concentration camps. Only about 4,000 survived. Artists who address LGBT deaths in the holocaust (or “homocaust”) include Tony O’Connell, Mary Button, William Hart McNichols, Richard Grune, John Bittinger Klomp and those who designed the world's dozens of memorials to LGBT Holocaust victims. Their art is featured here today. 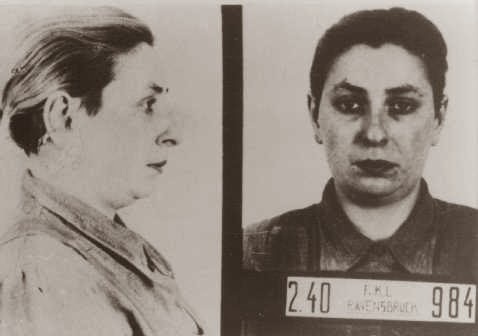 The defeat of the Nazis brought liberation for most prisoners in the concentration camps, but some of those accused of homosexuality were re-imprisoned in post-war Germany based on evidence found by the Nazis. The world's first LGBT Holocaust memorial was the Homomonument, opened in 1987 in the Netherlands. 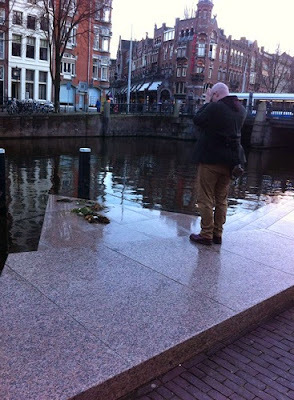 Queer British artist Tony O’Connell made a photo and video record of his prayers and offerings at the Homomonument in Amsterdam on Christmas Day 2014 as part of his contemporary performance art series of LGBT pilgrimages. O'Connell visits historical sites such as to the Harvey Milk Metro station in San Francisco, New York City's Stonewall Inn, and the Alan Turing Memorial Bench in Manchester. Democratizing the idea of sacredness and reclaiming the holiness in ordinary life, especially in LGBT experience, are major themes in O'Connell's work. Based in Liverpool, O’Connell was raised in the Roman Catholic church, but has been a practicing Buddhist since 1995. For more info about O’Connell’s art, see my previous post Codebreaker Alan Turing honored in queer pilgrimage by artist Tony O’Connell. 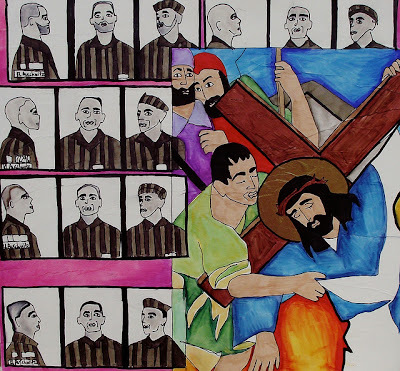 Persecution of LGBT people during the Holocaust is juxtaposed with Jesus falling under the weight of his cross in the image at the top of this post: Station 3 from “Stations of the Cross: The Struggle For LGBT Equality” by Mary Button. The painting features headshots of men who were arrested for homosexuality under Paragraph 175 of the German criminal code and sent to concentration camps between 1933 and 1945. Using bold colors and collage, Button puts Jesus' suffering into a queer context by matching scenes from his journey to Golgotha with milestones from the last 100 years of LGBT history. For an overview of all 15 paintings in the LGBT Stations series, see my article LGBT Stations of the Cross shows struggle for equality. Richard Grune, a Bauhuas-trained German artist sent to Nazi concentration camps for homosexuality, also saw a connection between Christ’s Passion and the suffering of people in the camps. 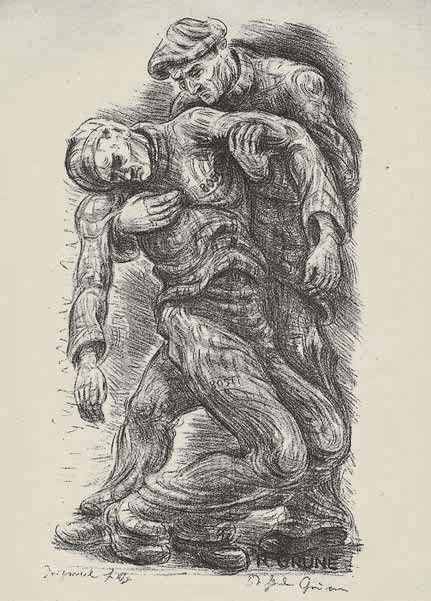 After being imprisoned in Sachsenhausen and Flossenbürg, he created “Passion of the 20th Century,” a set of lithographs depicting the nightmare of life in the camps. Published in 1947, it is considered one of the most important visual records of the camps to appear in the immediate postwar years. 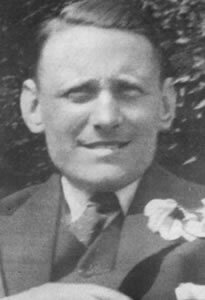 A gay Dutch artist who died in the Holocaust was Willem Arondeus (Aug. 22, 1894 - July 1, 1943). He participated in the anti-Nazi resistance movement with openly lesbian cellist Frieda Belinfante and others. Arondeus was openly gay before World War II began and proudly asserted his queer identity in his last message before his execution: “Let it be known that homosexuals are not cowards.” His life and art are featured in a YouTube video. Nazis used the pink triangle to identify male prisoners sent to concentration camps for homosexuality. Originally intended as a badge of shame, the pink triangle has become a symbol of pride for the LGBT rights movement. 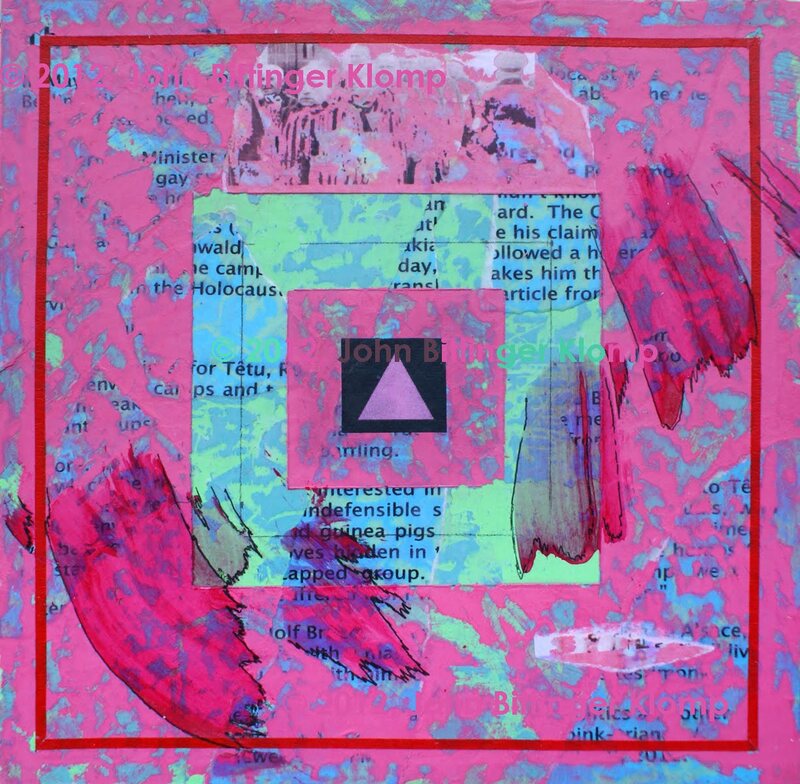 A recent painting on the theme is “Pink Triangle” by John Bittinger Klomp, a gay artist based in Florida. “The Pink Triangle was part of the system of triangles used by the Nazis during World War II to denote various peoples they deemed undesirable, and included Jews, Jehovah’s Witnesses and homosexuals,” Klomp said. The painting is part of his “Gay Dictionary Series” on words and symbols related to being gay. The pink triangle appears in a variety of monuments that have been built around the world to commemorate LBGT victims of the Nazi regime. In January 2014 Israel's first memorial for LGBT victims of the Holocaust was unveiled in Tel Aviv. Since 1984, more than 20 gay Holocaust memorials have been established in places ranging from San Francisco to Sydney, from Germany to Uruguay. 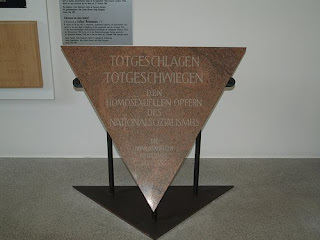 Some are in the actual concentration camp sites, such as the plaque for gay victims in Dachau pictured below. The logo for the Jesus in Love Blog also shows the face of Jesus in a pink triangle. He joins queer people in transforming suffering into power. The last surviving man to wear the pink triangle in the concentration camps was Rudolf Brazda, who died in 2011 at age 98. His story is told in his obituary at the New York Times. 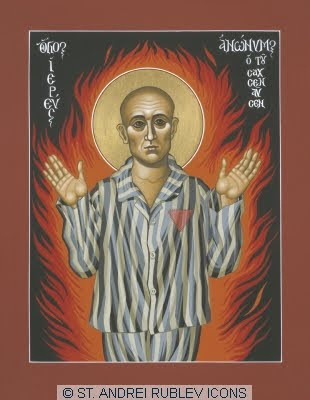 The priest is honored in the icon at the top of this post, “Holy Priest Anonymous One of Sachsenhausen.” It was painted by Father William Hart McNichols, a New Mexico artist and Catholic priest who was rebuked by church leaders for making LGBT-affirming icons of unapproved saints. His Anonymous Priest of Sachsenhausen icon appears in his book “The Bride: Images of the Church ,” which he co-authored with peace activist Daniel Berrigan. Here is the beginning of his tragic story, as told by Heger in his book The Men With the Pink Triangle . Toward the end of February, 1940, a priest arrived in our block, a man some 60 years of age, tall and with distinguished features. We later discovered that he came from Sudetenland, from an aristocratic German family. He found the torment of the arrival procedure especially trying, particularly the long wait naked and barefoot outside the block. When his tonsure was discovered after the shower, the SS corporal in charge took up a razor and said "I'll go to work on this one myself, and extend his tonsure a bit." And he saved the priest's head with the razor, taking little trouble to avoid cutting the scalp. quite the contrary. The priest returned to the day-room of our lock with his head cut open and blood streaming down. His face was ashen and his eyes stared uncomprehendingly into the distance. He sat down on a bench, folded his hands in his lap and said softly, more to himself than to anyone else: "And yet man is good, he is a creature of God!" The book goes on to recount in heartbreaking detail how the Nazis tortured the priest, hurling anti-gay slurs and beating him to death. 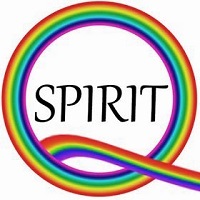 More excerpts are available at the Queering the Church Blog in a post titled The Priest With the Pink Triangle. The award-winning 1979 play “Bent” by Martin Sherman helped increase awareness of Nazi persecution of gays, leading to more historical research and education. A film version of “Bent” was made in 1997 with an all-star British cast including Clive Owen, Mick Jagger and Jude Law. Its title comes from the European slang word “bent” used as a slur for homosexuals. The 2000 documentary film “Paragraph 175” tells the stories of several gay men and one lesbian who were persecuted by the Nazis, including interviews with some of the last survivors. International Holocaust Remembrance Day is observed here with the prayer “We All Wear the Triangle” by Steve Carson. It appears in the book “Equal Rites: Lesbian and Gay Worship, Ceremonies, and Celebrations .” Carson was ordained by Metropolitan Community Churches and served congregations in New York, Boston and San Francisco. The play "Bent" was performed by one of our theater groups here in Atlanta years ago. I had the privilege of seeing it.